Adam Waldman, a Washington, D.C., lobbyist who works for Deripaska, emerged on the scene out of nowhere last week when Fox News published a batch of text messages he exchanged in 2017 with Warner. Waldman first approached Warner in March 2017 seeking to discuss a possible extradition deal for Wikileaks founder Julian Assange. Waldman, who owns Endeavor Law Firm, also represented that he had ties to Steele as well as to Deripaska. “Chris Steele asked me to call you,” Waldman wrote to Warner on March 17, 2017. Warner attempted to set up a phone call with Steele and suggested that he wanted to keep the matter a secret from other members of the Senate Intelligence Committee. But the negotiations appeared to end in May because Waldman said that Steele was reluctant to meet without a letter signed both by Warner and North Carolina Sen. Richard Burr, the chairman of the Senate Intelligence Committee. “Seems very weird that he won’t do a call. What wud a letter do to deal with his concerns,” Warner wrote in late April. Waldman sent several text messages over the following weeks, but Warner did not reply. Waldman’s relationship to Steele is odd because of his work for Deripaska as well as for Russian foreign minister Sergey Lavrov. Deripaska hired Waldman in 2009 to help him with a struggle over his visa, which the State Department revoked in 2006 because of alleged ties to Russian mobsters. Waldman registered as a foreign agent in 2010 after signing on to work for Lavrov to help with the Deripaska visa problem. That relationship ended in May. In his texts, Waldman suggested to Warner that he was in touch with the Justice Department regarding Deripaska. “Deripaska is in London Monday-Thursday and I might be able to arrange a mtg w him too if you wish. I discussed it with him today and he seemed interested,” Waldman wrote. He also suggested making Deripaska available for an interview with the Senate Intelligence Committee. Those talks later broke down because the committee declined to give Deripaska immunity. Waldman has not responded to numerous requests for comment about his relationship to Steele. A second Steele-Warner back channel? One name recently linked to the dossier is Daniel Jones, a former investigator for Democratic California Sen. Dianne Feinstein when she chaired the Senate Intelligence Committee. Jones was named in the January letter that Grassley sent to Clinton campaign and DNC officials seeking communications with a list of people linked to the dossier. Jones, who worked for Feinstein until Dec. 2015, also appears to have links to Steele as well as to Warner. “I pointed out there is no privilege in that discussion although Dan is a good and very trustworthy guy,” he added later. “I encouraged him to engage with you for the sake of the truth and of vindication of the dossier,” added Waldman. Jones, who operates the Penn Quarter Group, a consulting firm, did not respond to a voice mail or private message on Twitter. Grassley is also inquiring about Paul Hauser, a London-based lawyer who has represented Deripaska for years. In a letter released to the public on Monday, Grassley hinted that Hauser and Deripaska have worked with Steele in the past. “Is it the case that Mr. Steele, through you, works or has worked on behalf of Mr. Deripaska or business associated with him?” Grassley asked Hauser, who works for the firm Bryan Cave. 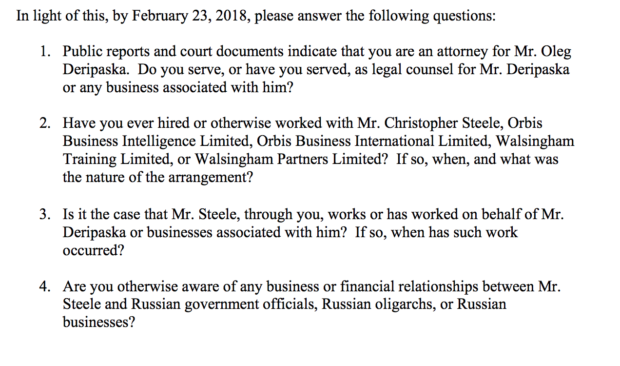 Grassley’s letter does not present evidence that Steele has worked with Hauser or Deripaska, including on the dossier. But any link between the trio would have interesting implications for the salacious and unverified document. Steele’s dossier sources are largely unknown, though it has been reported that he used Russians to relay information about Kremlin activity. Two other names to emerge amid the dossier probe are Cody Shearer, a longtime Clinton insider, and Jonathan Winer, a former State Department official who is friends with Steele. It was reported earlier in February that Shearer wrote two memos — dated Sept. 24, 2016 and Oct. 12, 2016 — making some of the same allegations as the Steele. The dossier and the Shearer memo both allege that the Kremlin has video recordings of Trump engaged with prostitutes during a visit to Moscow in 2013. Shearer gave his document to his friend and fellow Clintonista, Sidney Blumenthal. Blumenthal gave it to his friend Winer who passed it to Steele. Steele gave the document to the FBI in Oct. 2016. Steele also shared documents from his own dossier with Winer, who at the time served as special envoy to Libya. Winer wrote up a two-page summary of the Steele report and shared it with other State Department officials, including then-Secretary of State John Kerry and Victoria Nuland, who then served as assistant secretary of state for European and Eurasian Affairs. According to their own telling, Winer and Nuland said that the dossier was not something that the State Department could assess. So the document was given to the FBI. Details about Shearer’s antics have slowly come to light. He received his information from someone claiming to be affiliated with the FSB, Russia’s security services. Shearer’s memos also include information from conversations he had with journalists, including from The Wall Street Journal, ABC News, and CNN. The New York Times reported Friday that Shearer has scoured Europe over the last six months in search of incriminating video on Trump. It is unclear who is paying him for the investigation and what, if anything, he has uncovered.